Market remaining remnant inventory to thousands of Agents and Buyers. 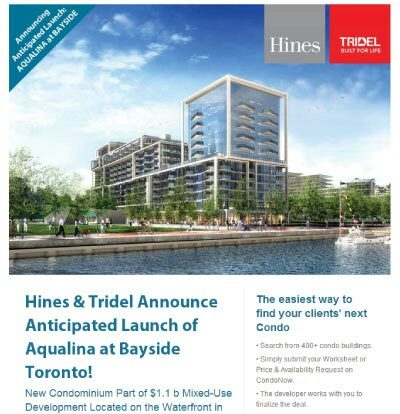 Expand your distribution channel including Agents and Buyers who are actively looking for new Condos. Market remaining remnant inventory to thousands of Agents and Buyers who today may not otherwise have access to or consider new condo properties. Prospects can search for remnant inventory in the same way they do with the MLS. 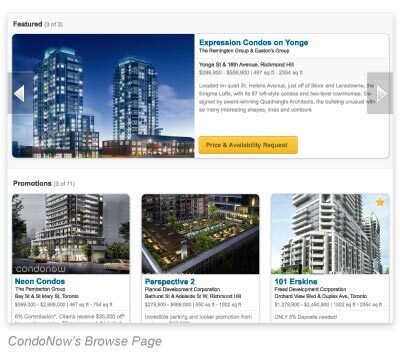 Buyers and Agents can easily browse your promotions including, promotions specifically geared towards the Agent. Basic advertising and setup is free. 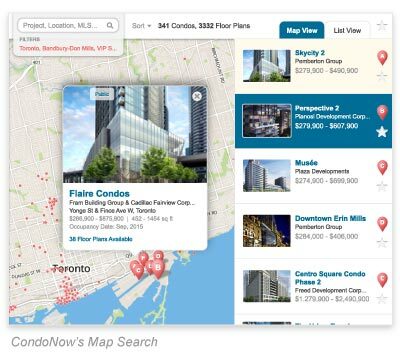 It allows the Prospects to easily find their client a New Condo at the moment they have a need. This keeps your projects in Prospects' focus at all times. 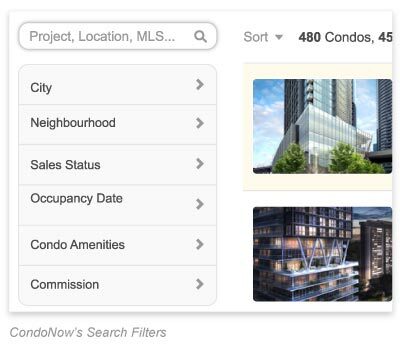 Buyers and Agents can easily follow and browse through VIP projects and coming soon projects. Ensuring your message gets to the community. Advertising packages are available to maximize your exposure / lead generation and the pricing is designed to meet any marketing budget. a very robust search engine. be sold to end users. they are looking for one. there is still a lot of interest. for a set, reasonable budget. for new condos per visit! Get top spot regardless of search request. Guarantees the most amount of impressions. Maximum 5 spots per month. Only available to Platinum Projects. Sent to thousands of real estate Agents. Average of 5,000+ opens & members average a 35% open rate! Go from a manual process to a fully digital solution. Automate the process of collecting worksheets and easily allocate units based on a built-in Agent-ranking system. Full email workflow keeps it simple for both the Developer and the Agent. 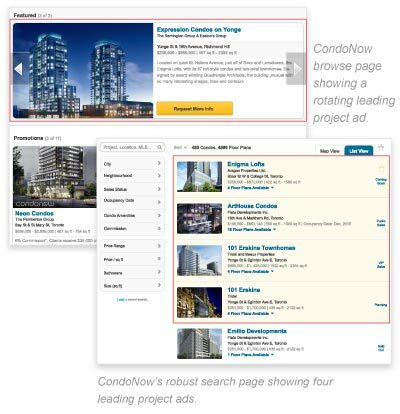 Integrates with your website or Agent portal. 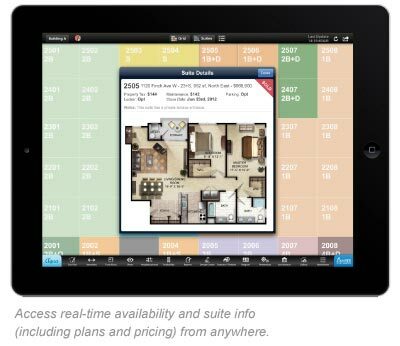 No more reliance on paper - The iPad-based Price & Availability Management allows the entire sales team to always be up-to-date with real time updates to plans and pricing. A simple step-by-step wizard will walk sales people through the contract generation process cutting down on costly human error. 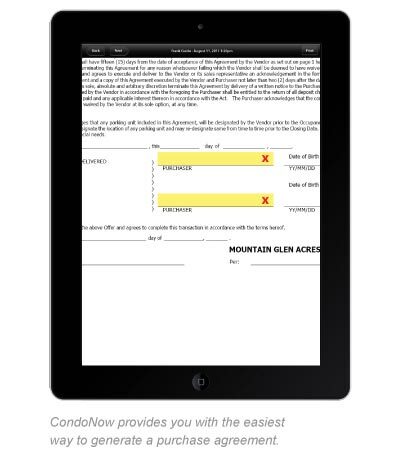 Start accepting digital signatures introducing the buyer to a better sales experience. For more information, or to speak to a CondoNow representative, please contact us below or call us at 416-661-2244 x231. To Learn More and get a personal presentation, please fill out the form below.